THOM Yorke has admitted Radiohead are to release their latest album on CD ...because of his mum. The enigmatic frontman revealed his allegiance as he announced a massive gig on Glasgow Green next June 27. 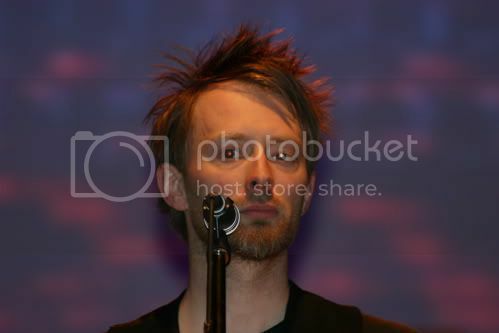 Radiohead originally released seventh album In Rainbows in October over the internet only. More than 1.5 million fans were even allowed to choose how much they wanted to pay for the download, with some coughing up just one pence. The move caused massive debate within the music industry and was welcomed by the public. But now Yorke, 39, - who grew up in Fife - has denied cashing in on fans by not sticking to the internet and issuing the CD version on December 31. Revealing his family tie, he said: "If we had left it at that, there would have been loads of people who would never have heard the record. "People like my mum - she's still asking me to make a copy for her. "Also people in Brazil, in Argentina, in Japan ... they haven't downloaded it because we couldn't get it together to do a multi-lingual website. "It's utterly ridiculous for people to assume there will only be the download. It wasn't this purist thing. "The record is the thing that comes first, not the means of distribution. Everyone jumped on the download thing as this sort of anti-music business gesture. "Actually it was just a means to an end for us. Taking on the music business was not the point." The first single from In Rainbows, "Jigsaw Falling Into Place", will be out in early 2008. But it seems the music business is biting back for fans who cannot wait that long. On Monday, their former label, Parlaphone, will reissue all their albums from 1993-2003 - Pablo Honey, The Bends, OK Computer, Kid A, Amnesiac, and Hail To The Thief plus a live album I Might Be Wrong - in a CD box set or 4Gb USB stick. That will make Radiohead the first big act to issue a memory stick holding seven albums. And fans can expect the best of their classic and new material at Glasgow Green - the band's first Scots show since their 2006 gig at Edinburgh's Meadowbank Stadium.